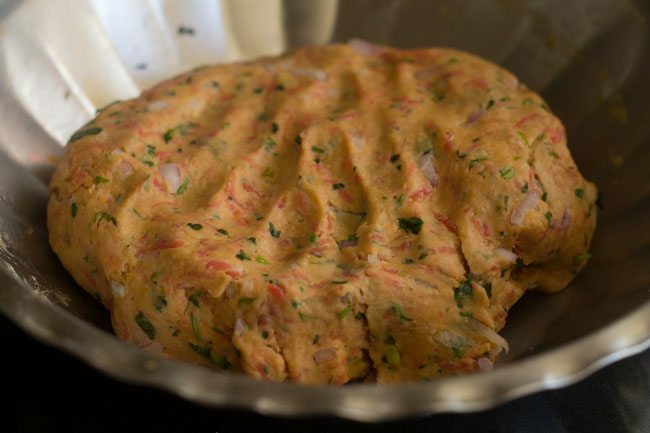 gajar ka paratha recipe - healthy and delicious whole wheat parathas made with carrots. 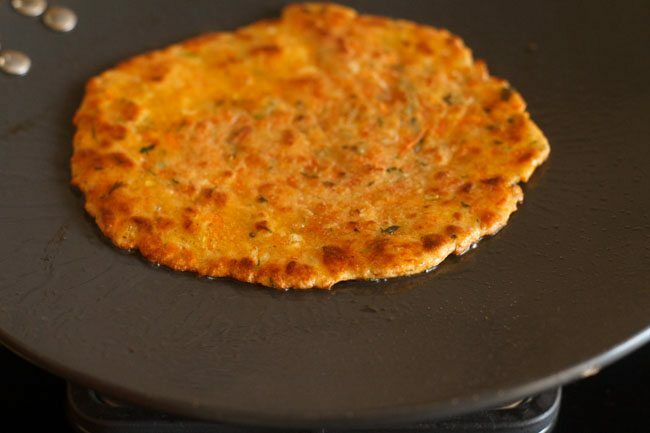 carrot paratha recipe with step by step photos. 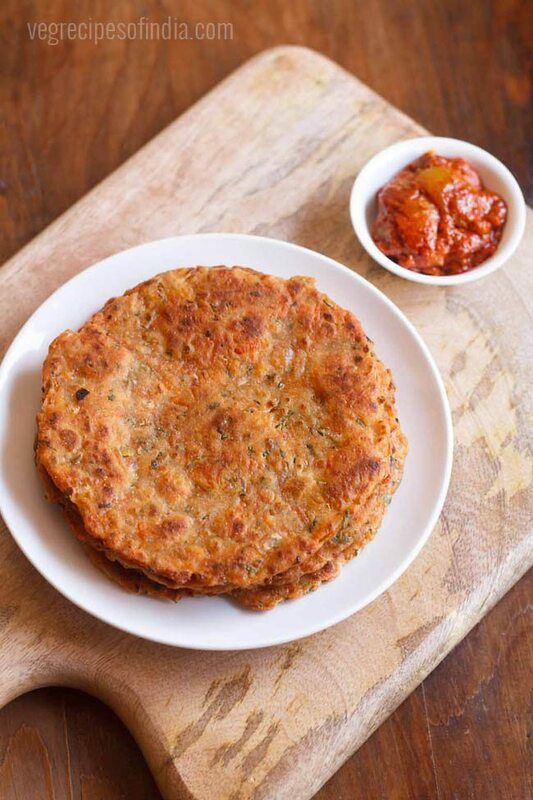 healthy and delicious whole wheat parathas made with carrots. 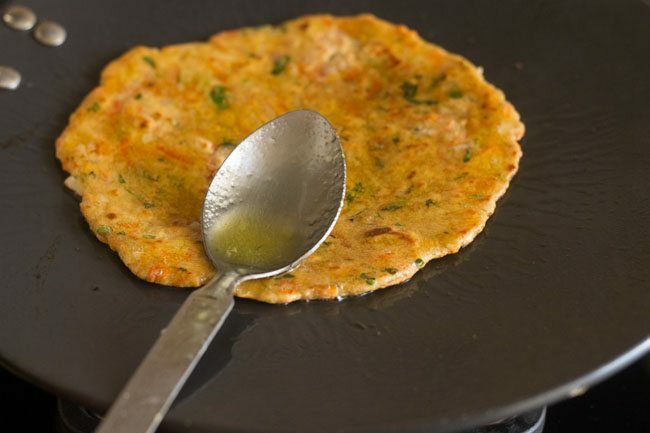 hot or warm carrot paratha with a dollop of butter or ghee would be a perfect breakfast or brunch in this cold weather. 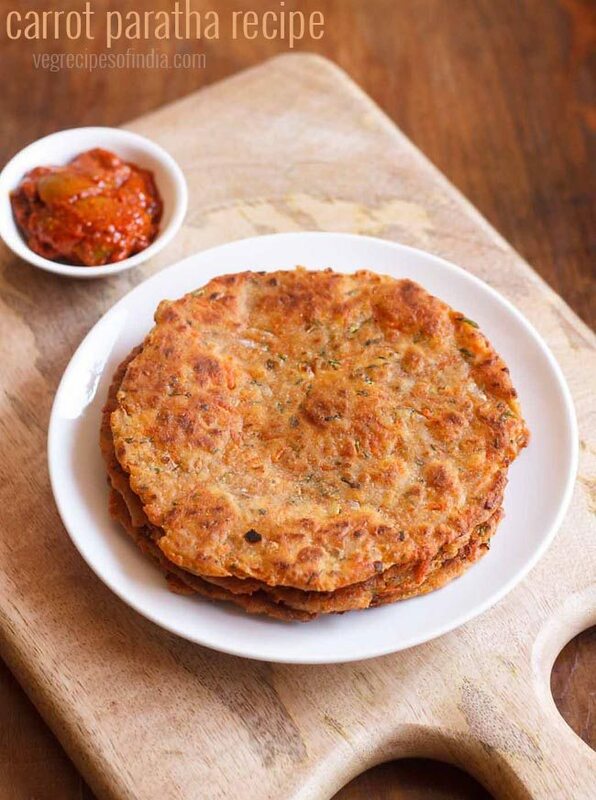 these gajar ka parathas are slightly crisp from outside and soft from within. 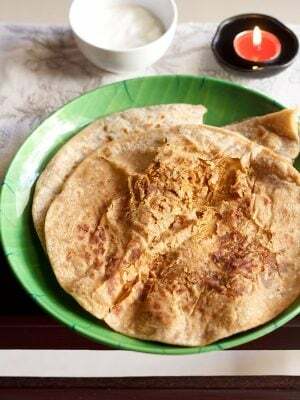 since these parathas are delicious as well as healthy, they make an ideal snack to be packed for tiffin box or lunch box. 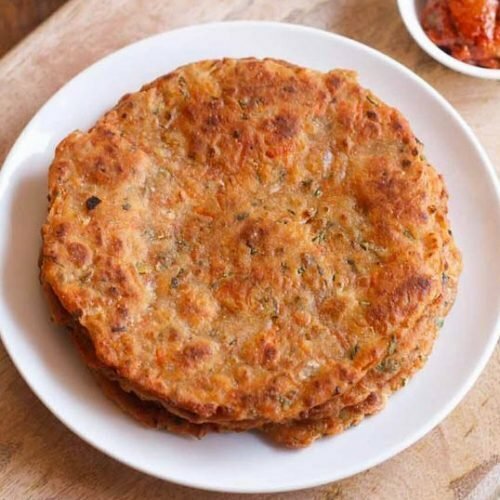 carrot paratha recipe is quick and easy to make. 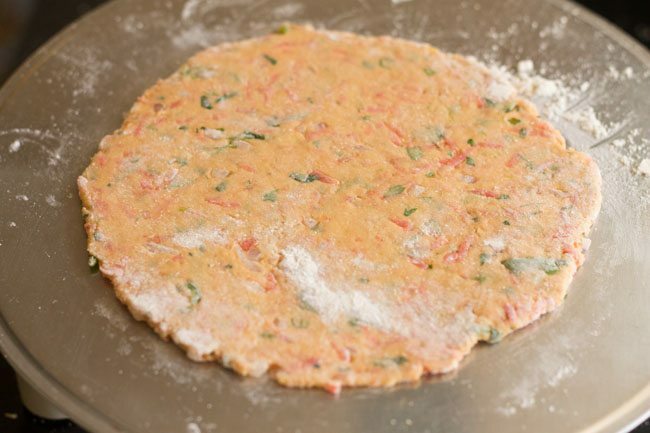 you just have to add grated carrots, chopped onions and some herbs to the dough. knead the dough, roll with a belan and roast the parathas with ghee. parathas are made in every home and each family has their own way of preparing parathas. 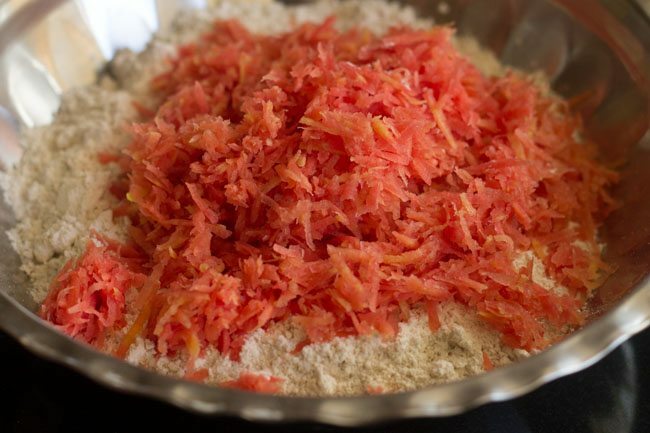 this carrot paratha recipe comes from my mom. we were at mom’s place, so she made us these parathas. since i was carrying the camera, i took the pics also and decided to share the recipe. 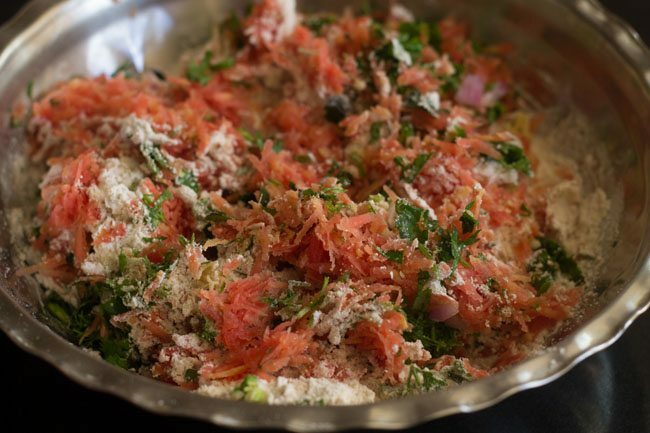 we usually add finely chopped ginger, chopped curry leaves, chopped onions and coriander leaves along with grated carrots in the dough. 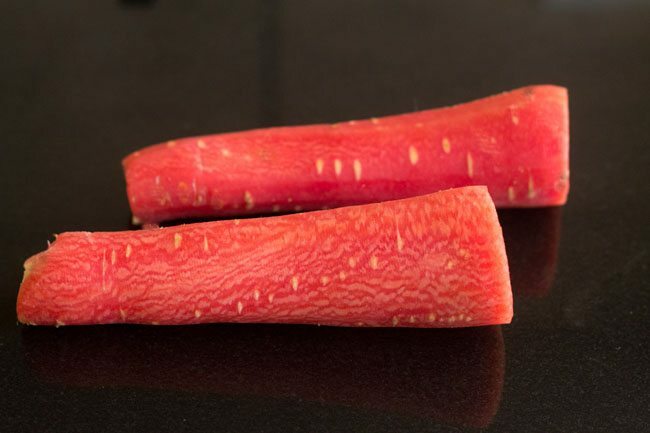 carrots impart a sweet taste which compliments the taste and flavors of the herbs used. i generally make plain paratha along with dishes like mix veg, palak paneer, dal makhani. but if i make carrot paratha or mooli paratha or any stuffed paratha then we have them with plain curd or raitas or pickles. rinse and then peel 2 medium sized carrots. grate the carrots and place aside. 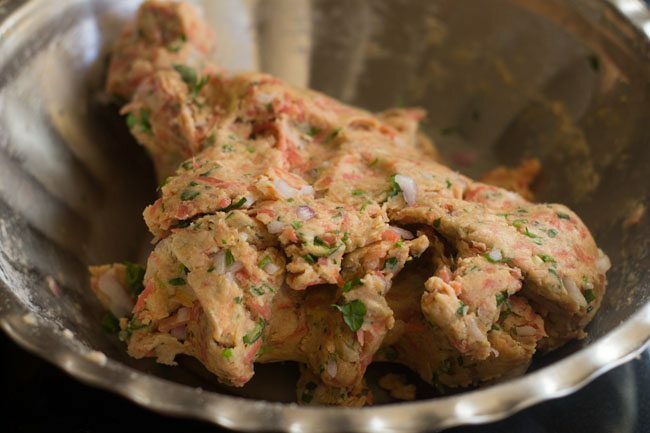 finely chop onion, ginger, curry leaves, green chili and coriander leaves. keep all the ingredients ready for the parathas. 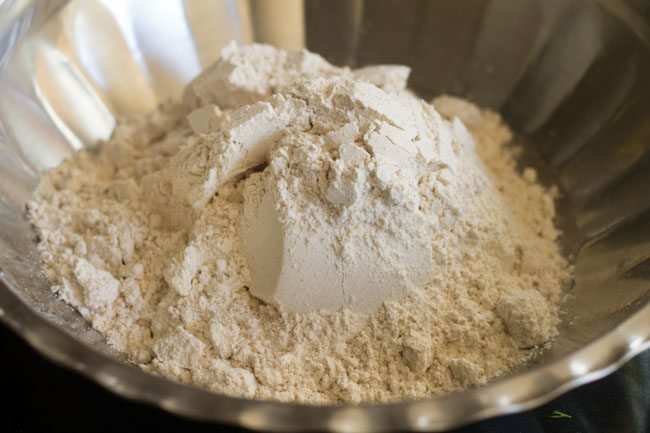 add 1.5 cups of whole wheat flour into a thali or mixing bowl. add ¼ teaspoon salt or as required. 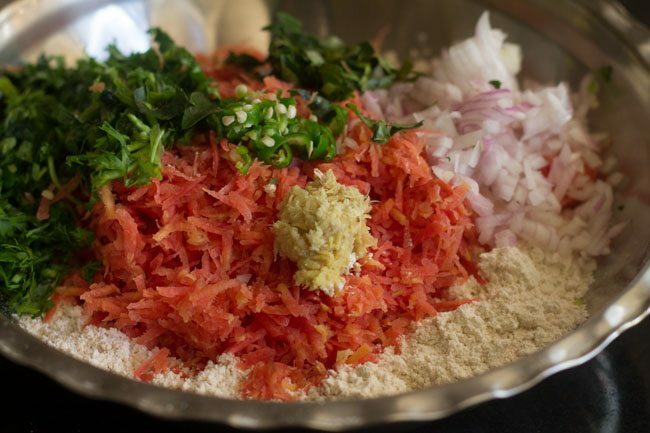 now add 1.5 cups grated carrots (gajar), ⅓ cup finely chopped onions, ⅓ cup of chopped coriander leaves, 1 chopped green chili, 1 teaspoon finely chopped ginger along with 15 chopped curry leaves. mix everything very well with your finger tips. soon the carrots will start leaving moisture. pour ¼ cup of water or as required. since carrots leave moisture add water wisely. 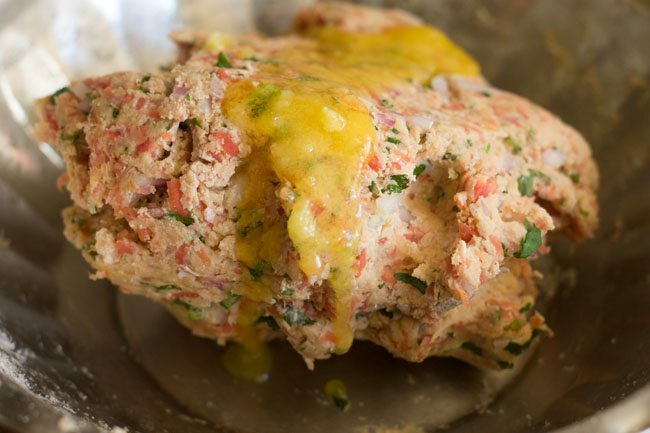 begin to gather the mixture and start kneading to a smooth dough. drizzle 1 tablespoon of ghee on the dough. knead till you get a soft and smooth dough. in case the dough gets sticky then add some flour and knead again. cover the dough with a linen cloth or lid. allow the dough to rest for 10 to 15 minutes. dust some flour on the ball. alternatively you can place the ball in a box containing whole wheat flour. 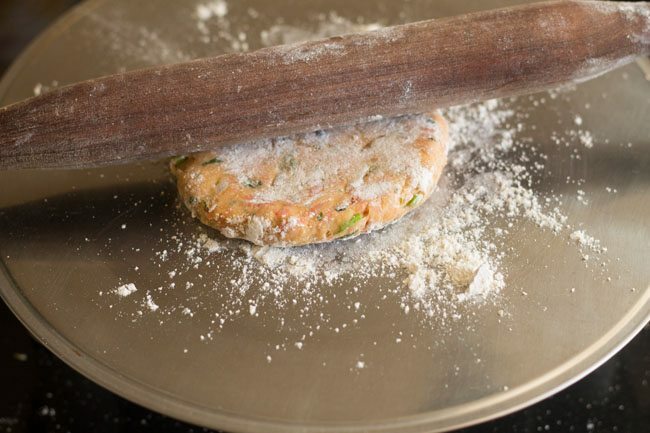 begin to roll with a rolling pin (belan). while rolling dust some flour if required. roll into medium sized rotis or rounds. 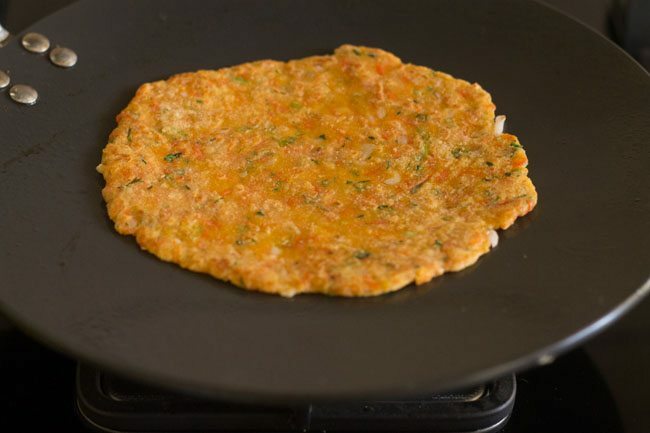 place the rolled carrot paratha on a hot tava or griddle. 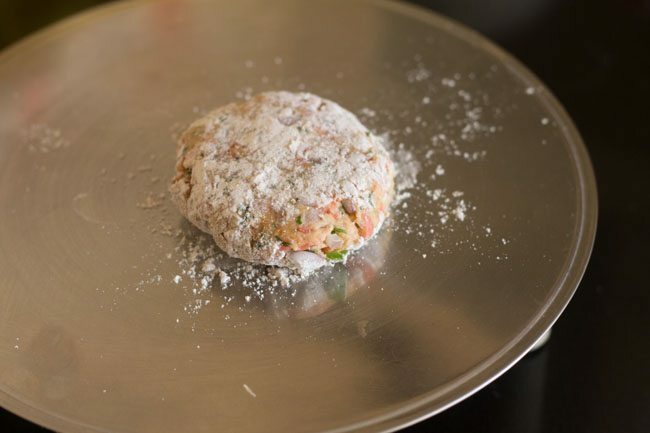 when one side is partly cooked or about ¼ cooked then flip it. spread some ghee or oil on the partly cooked side. flip again with the help of tongs or spatula. you will see some brown spots on the parathas. apply some ghee or oil to this side too. flip the carrot paratha a couple of times. 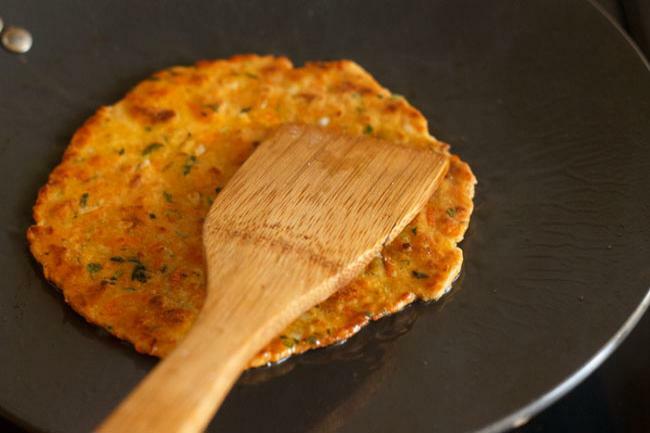 also press the edges of the carrot paratha with a spatula so they are cooked evenly from all sides. once the parathas are roasted and cooked well, remove the parathas. similarly prepare the remaining parathas. you can stack and keep the parathas warm in a casserole. or you can also serve the carrot paratha while they are hot or warm with pickle or raita. if the dough is sticky then add some flour and knead again. 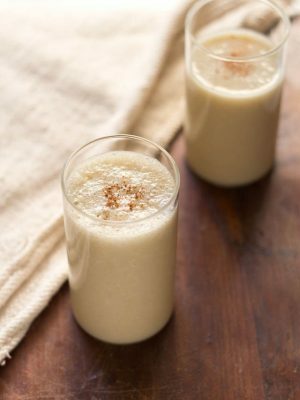 you can add any vegetable like bottle gourd of pumpkin instead of carrots in this recipe. 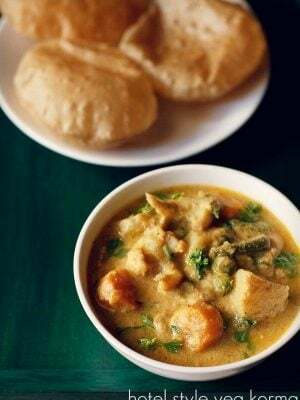 if using veggies with a high water content like bottle gourd or zucchini, then do not add water while kneading the dough or add very little water. 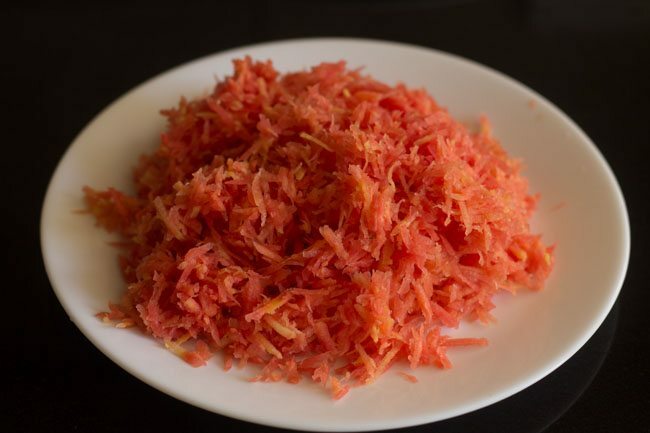 1. rinse and peel 2 medium sized carrots (gajar). 2. grate the carrots. keep aside. 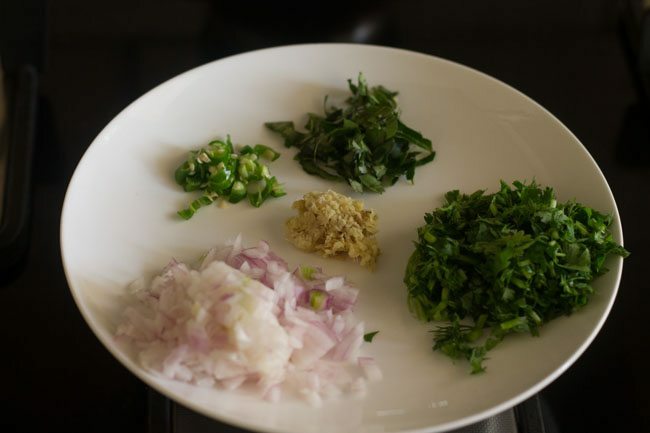 3. chop onion, ginger, curry leaves, green chili and coriander leaves. 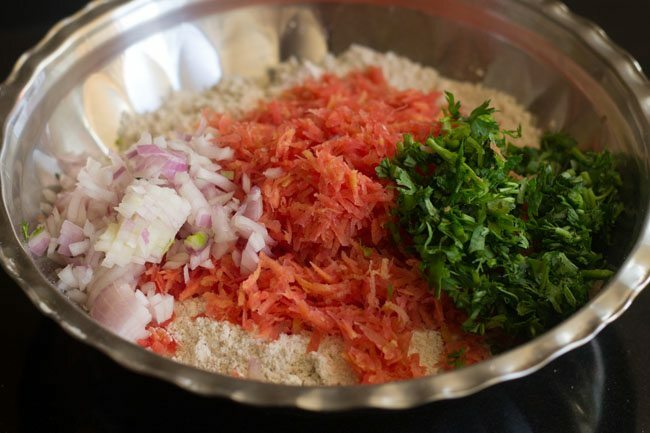 keep all the ingredients ready for making gajar paratha. 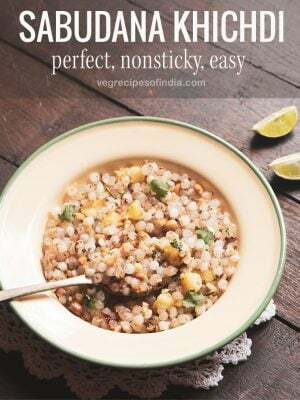 you will need ⅓ cup finely chopped onions, 1 green chili (chopped), ⅓ cup chopped coriander leaves, 1 teaspoon finely chopped ginger and 12 to 15 curry leaves (chopped). 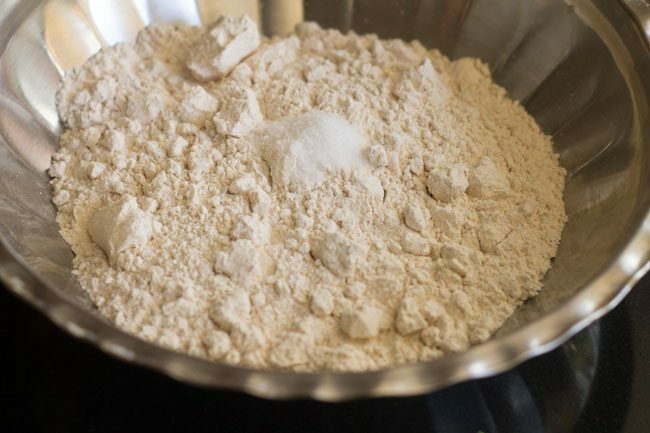 4. take 1.5 cups whole wheat flour into a thali or a mixing bowl. 5. add ¼ teaspoon salt or as required. 6. now add 1.5 cups of the grated carrots. 7. next add ⅓ cup chopped onions and ⅓ cup chopped coriander leaves. 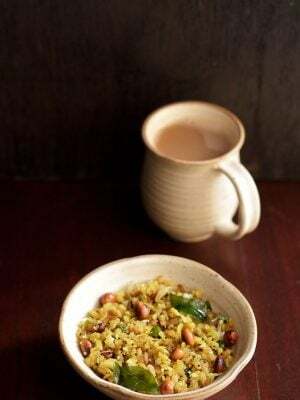 8. also add 1 chopped green chili, 1 teaspoon finely chopped ginger along with 15 curry leaves (chopped). 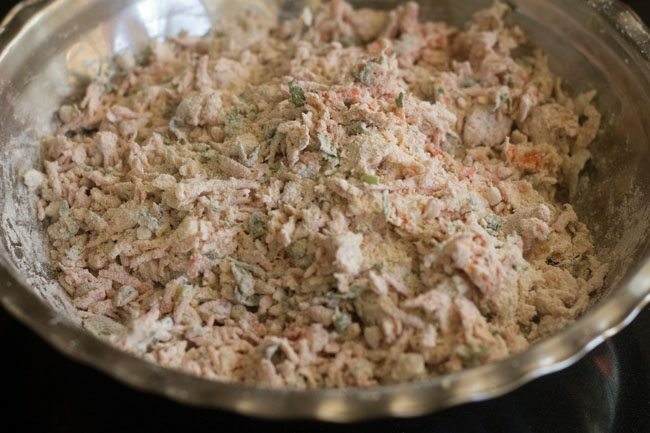 9. mix everything very well with your finger tips. 10. soon the carrots will start leaving moisture. 11. pour ¼ cup of water or as required. since carrots also leave moisture so add water wisely. 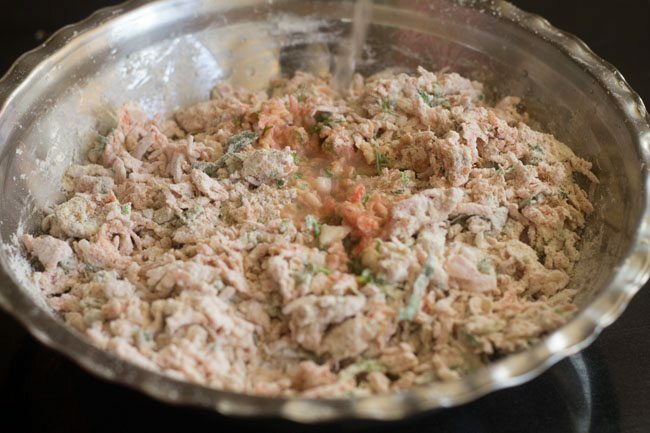 12. begin to gather the mixture and start kneading to a smooth dough. 13. drizzle 1 tablespoon of ghee on the dough. 14. knead till you get a smooth and soft dough. in case the dough gets sticky then add some flour and knead again. 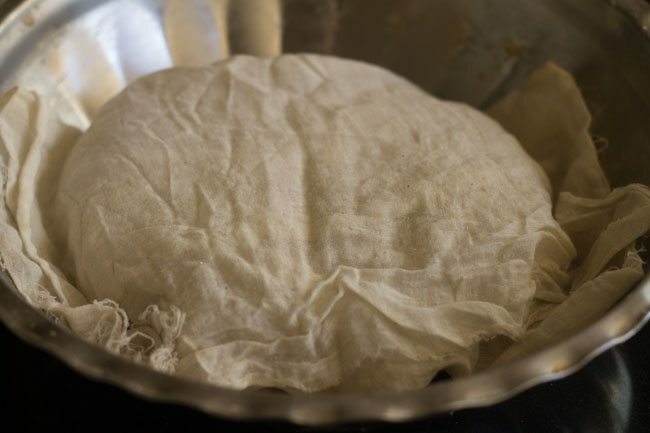 15. cover the dough with a linen cloth or lid. allow the dough to rest for 10 to 15 minutes. 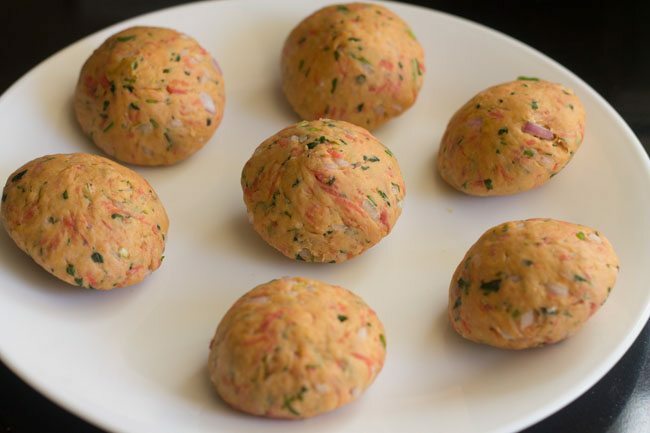 16. make small to medium sized balls from the dough. 17. dust some flour on the ball. alternatively you can place the ball in a box containing whole wheat flour (atta). 18. begin to roll with a rolling pin (belan). while rolling dust some flour if required. 19. roll into medium sized rotis or rounds. 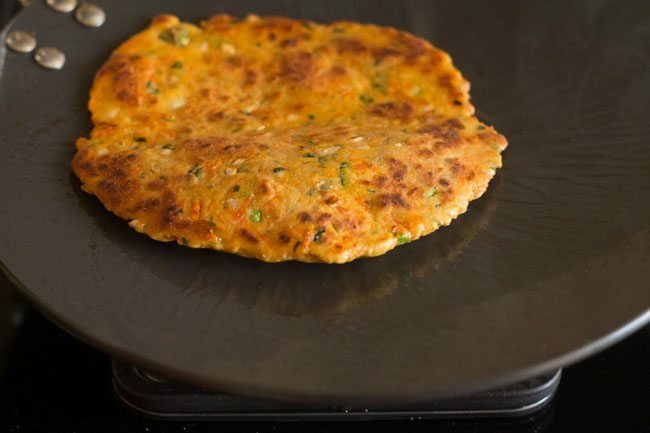 20. place the rolled carrot paratha on a hot tava or griddle. 21. when one side is partly cooked or about ¼ cooked then flip it. 22. spread some ghee or oil or butter on the partly cooked side. 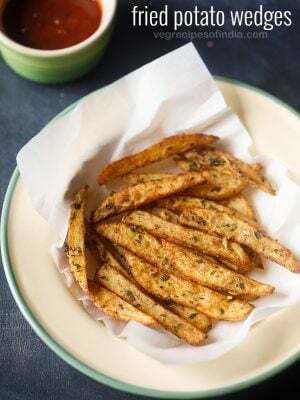 23. flip again with the help of tongs or spatula. you will see some brown spots on the gajar paratha. apply some ghee or oil to this side too. 24. flip the parathas a couple of times. 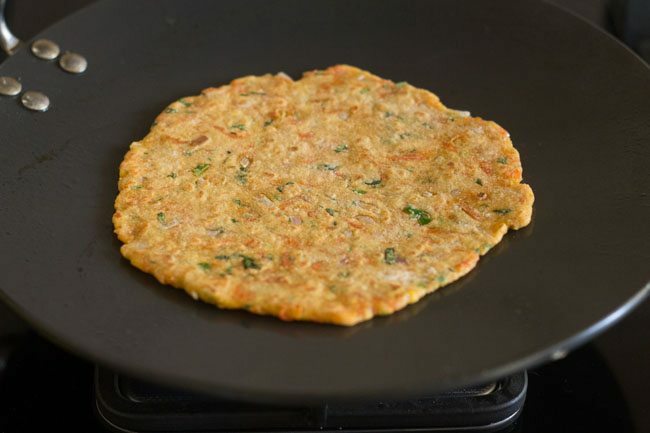 also press the edges of the gajar paratha with a spatula so they are cooked evenly from all sides. 25. once the carrot paratha are roasted and cooked well, remove the parathas. similarly prepare the remaining parathas. 26. you can stack and keep the parathas warm in a casserole. 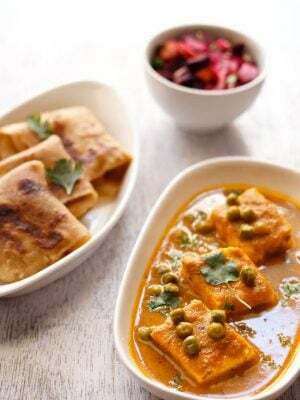 you can also serve the carrot paratha while they are hot with mango pickle or raita. Have you got wheat free recipes? I Tried today morning taste is very nice. Instead of ghee can i use oil ? yes you can use oil. Thanks Shweta. for making parathas, knead the dough very well. use a good quality atta which will give you nice soft paratha. applying ghee you are already doing which is good. wrap them well in aluminium foil or you can keep in a air tight steel tiffin box. welcome hithesh. thanks for your kind words. I only had carrots in the fridge and searched carrots on your website and came up with this recipe. They were delicious, thanks so much..You have an amazing collection of recipes.. Welcome RA. Thanks for your positive feedback on recipes. Made these parathas today and they were really delicious. 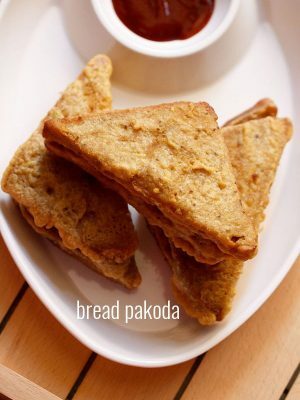 Ginger imparts a very nice flavour to these parathas. Even my kids who are fussy eaters liked them . Thanks Rekha for sharing positive feedback on carrot parathas. Glad to know that your kinds liked them. I made this for breakfast today and they tasted great. But the colour was not as good as yours. Wanted to check if you used the orange carrots or the red ones. I used the normal carrots…so not sure if it was the carrots or maybe i didn’t use enough of it? They were delicious and got over in no time…so no complaints there…just wanted that lovely colour like yours!! Ok, guess that was the difference…will try it with those next time…Thank you! thanks deepshikha for this feedback. yes the taste is somewhat like thalipeeth. I lost it when my finger accidentally touched something on the page, but this time, knowing where the beets recipe booklet turned out to be, I found it right away. Knowledge is always so helpful. thanks lucy. you can save the beets recipe collection in the favorite section of app or even a search will give you the collection page.